Part 2 – Is my pension fund growing? The first in a series of four articles, this first article looks at what is happening in equity markets, known as changes in equity price action. This has an impact on your pension if the market is not going up. It is now time to look forward in wealth management. We need to look forward to the next 30 years, not back at the last 30 years. Some of the old wisdoms, for example the buy and hold strategy, should be questioned. This is NOT to say that you should start trading on a daily basis. However, attention needs to be given to how you invest. In the last few years index trackers have become very popular with the argument being that it is not easy to beat the index. In the 1970s, 1980s and 1990s, indices did perform and this was perhaps true. We regularly see comments such as this in the press. 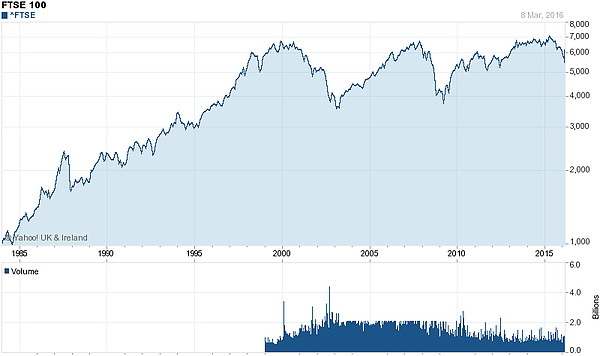 Yet I contend that this argument is based on the periods of stock market growth seen up to the end of the 1990s. I contend that this “accepted norm” needs to be reviewed, particularly in the context of managing your wealth during retirement. The above graph illustrates the growth in the FTSE 100 index up to the late 1990s and the subsequent lack of advance in the FTSE level from the year 2000 to today. There are many markets we could have shown with similar profiles. For example, if you had bought one of these 10 indices and held that index until today you would have EXACTLY the same value less costs. Also, the value of £100,000 in 1998 would be worth only £67,133.81 in 2016(i) because of inflation causing a severe loss in your spending power. In planning for or during retirement this strategy of buy and hold would have been particularly damaging. Another reason often quoted as the reason for using a tracker fund is “the costs are much less”. Yes, the costs are less as it is primarily a computer programme that is used for a tracker fund. Yet the return to an investor is not just cost, it is performance less costs. If an index falls and you are tracking it, you have a problem. 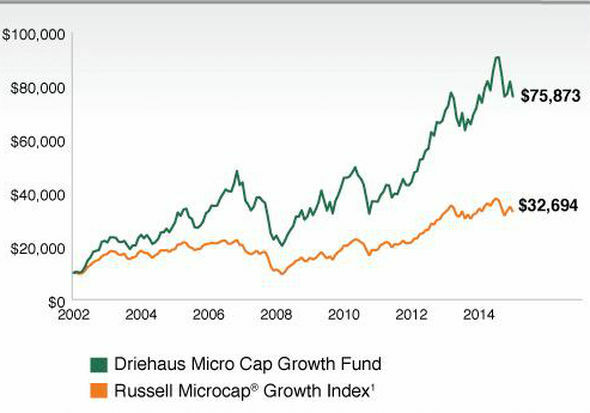 However, by comparison to the index fund here is the graph for a fund with active managers and much higher charges. The charges in this case are VERY worthwhile paying to get the performance. To give some balance here, yes, I have used a high performing fund in the chart above, with a higher risk rating than an index and that fund would only be used for a small part of a portfolio. Also not all funds are capable of this type of performance. However, it does illustrate the point very well that sometimes you get what you pay for. This is not to say that trackers do not have some value in the current environment. They do in circumstances perhaps where the market has fallen 20% or 30%. A purchase here and a disposal after a 15% or 20% rise in the market is very valid. In the next article we examine why this price action is happening and what this means for the future.